A collection of photocopied documents supplementing our Fallout Shelter Design Collection with over 17 of additional designs. 1. 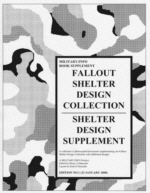 We also have two other book supplements along with this supplement: Shelter Living Supplement, Basic Fallout Shelter Survey, as well as the basic book: Fallout Shelter Design Collection. Shelter Living Supplement adds information on stocking a shelter, emergency medical instructions, and radiation monitoring basics. Basic Fallout Shelter Survey has detailed instructions on evaluating urban and rural construction for radiation shielding. 2. Our book supplements are patterned after our Research Packets. That is they come as unbound photocopies. Details.